The jeans you wear, the orange juice you drink, the laundry detergent you use: None would be possible without the activity of enzymes. Currently the enzymes used in industry are produced through an expensive, laborious process, requiring cold storage. But an innovative new approach, ushered in by research from Penn's School of Dental Medicine, is opening up a whole new way of making these valuable proteins. 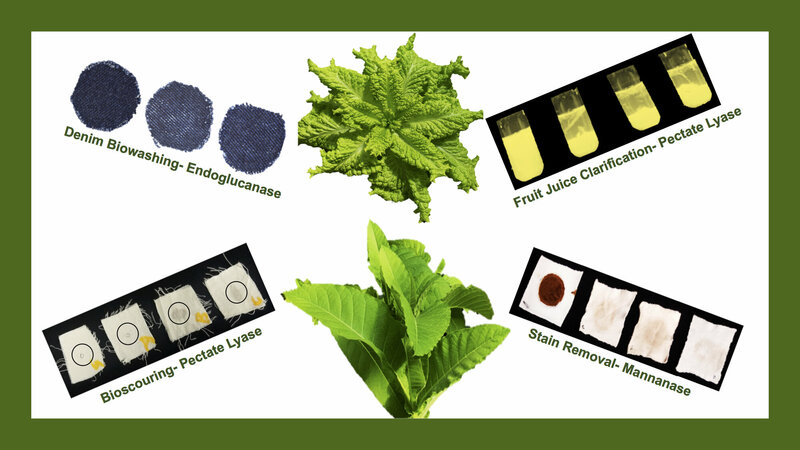 Kredit: Uma Kumari/University of Pennsylvania.Two new studies, led by Penn Dental Medicine biochemist Henry Daniell, reveal that enzymes grown in plants can be as effective as the traditional microbial-derived enzyme at accomplishing a number of industrial tasks, from clearing orange pulp from juicing equipment, cleaning laundry stains, removing dye from textiles, or de-pilling fabric. Such plant-grown enzymes have the added benefit of being cheaper to produce and shelf-stable in a powdered form, requiring no refrigeration. "Some of our enzymes are even more efficient than the current processes because you avoid all the stages that are required to process the microbial products: fermentation, purification, and cold storage and transportation," says Daniell. "I am excited to have pioneered the production of technology that is part of everyday activities, and can make a major difference in affordability." The technology has led to the launch of Phyllozyme, a startup company that now occupies lab space at the Pennovation Center, an incubating environment that is home to about 350 innovators at the University's Pennovation Works development.